Will I see a Parrot when I go to a Tropical Beach? The odds are you will not unless you are on a very remote island that just particularly has been populated with parrots. These are birds that have a natural habitat in the jungles in the tropical and sub tropical regions of the world, mostly the Amazon. The two largest reasons this is becoming more true every day is because of the encroachment of people in their natural habitat. Another larger reason is that many poachers and capturing them so they can be sold for profit on the black market. To help bring the parrot back to the tropical décor of a beach, many shop and resort owners have purchased one or more of these birds. The better ones or those that really care about this beautiful and colorful bird, place them in an aviary. Unfortunately most of them are just placed in a cage near the entrance of their establishment. There are many reasons a live parrot adds to the tropical décor of any establishment. While the ones in aviaries look more relaxed flying free, the ones in cages are more apt to have the ability to talk to you. Yes it is only a mimic, but it is entertaining. Just like with most things, make sure you do not train one to say anything embarrassing. They also mimic whatever they hear with not censorship. If they hear a word or words too many times, they will repeat it. 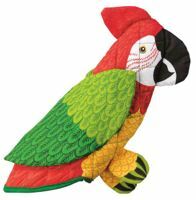 The presence of a parrot in a tropical décor theme area will also add natural and wonderful color to the place. These birds come in 372 different varieties. This includes the famous red and blue macaws. They also have other colors on then including yellow under wings which is beautiful to see when they are flying. One of the easiest and most common of the birds in the parrot family you will see is the parakeets. These are the smaller and medium size parrots that are in a wide variety of colors. They are the most common because they are also the most plentiful. This is easily translated to be the least expensive to purchase. For those of you looking for parakeets in the wild, they are only in South American around the Amazon jungle. Pictures, signs and knick knacks of parrots are far more common near a tropical beach. Not only are they less expensive, but they are extremely more easy to care for. Remember a live parrot repeats what it hears. If you have decided to purchase on to go with your tropical décor, do not say things around it you do not wish others to hear. This should include nick names of your lovers along with bad names for the people you are with, but do not care for. Remember parrots are an equal opportunity repeater of words. They are wonderful to see and hear, just remember they can also be a witness to your true feelings.